By Lindsey Johnson of Café Johnsonia for Design Mom. 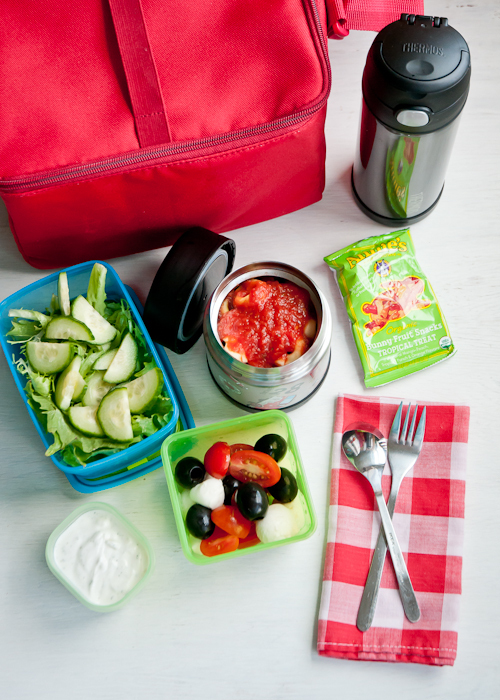 Here’s Menu #15 in our Lunch Box Series — pasta, sauce, and salad! A sure to please combo that my kids adore. And with the right equipment (click through for sources), the pasta really does stay warm till lunch. – Preheat the insulated bowl by adding boiling water to it and hot pasta and sauce. It really does stay warm for hours! – Swap out the tortellini for other filled pastas like ravioli or lasagna, or use other pasta shapes to make things even more fun. This is a fantastic series! It’s been tough to navigate lunch time with no peanut butter, so I look forward to each installment. Gwyneth Paltrow’s new cookbook has a homemade ranch dressing, and I love your idea of using greek yogurt. I make my own yogurt (so easy!) and sometimes make yogurt cheese by straining it over coffee filters in the fridge overnight. Add the same ingredients as you would to ranch dressing, and you have a healthy dip for veggies! Do you know of a flat/box like container that is insulated that you would recommend? I send leftover homemade pizza sometimes for lunch, and his preschool currently will heat it up, but I know that won’t happen in kindergarten. He doesn’t need it hot, but if I would like something insulated. I’ve seen mixed reviews on everything at amazon I’ve looked at. Laura, I’m still looking! I’ll let you know if/when I find anything. Just wanted to let you know how much I appreciate this Lunch Box series! I have three kids – 14, 11, and 7 – at 3 different schools, and all 3 refuse to eat school lunches! You’ve gotten me out of my sandwich, chips, fruit, goody rut – they LOVED the pasta salad, and it was easy for me. I’ve been including more fruits and veggies – instead of chips AND and goody (cookie, granola bar, etc). Please keep going!